Satrina Buff Frames is a buff and debuff window addon. Unlike many other addons of this type, it allows you to make multiple windows all of which can be configured individually to display different information. The addon’s official home can be found at Satrina Buff Frames. Alternatively, it is available through the curse downloader, through their website or via wowinterface.com. 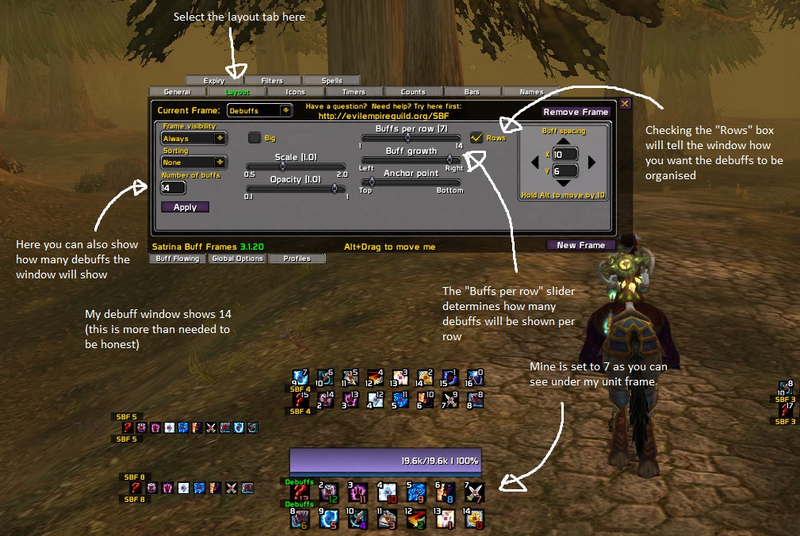 The following will describe how to set up a basic window to show YOUR (the player) buffs. First things first, is to create your first buff window. There is a button to the bottom right of your config window called “New Frame”, click on that. For this frame, we’re going to set it up as a general player buff frame. That is to say, its going to show your general buffs. (Whitelist and Blacklist determines what buffs or debuffs will be shown. A “whitelist” will show no buffs or debuffs except the ones you select (i’ll come to how you select later). A “blacklist” will show ALL buffs or debuffs except the ones you select. As mentioned, in this example, we’re creating a default buff window. So it will show all buffs that a player will give you. For example, Fort, Pally Blessings, Gift / Mark of the Wild, Arcane Intellect etc. At present, your buff window will show you every buff your character receives. Now to move it to where you want. Click on the tab at the top of your new window and drag to where you wish these to appear. In my case, I have all general buffs showing in the top left of my screen. 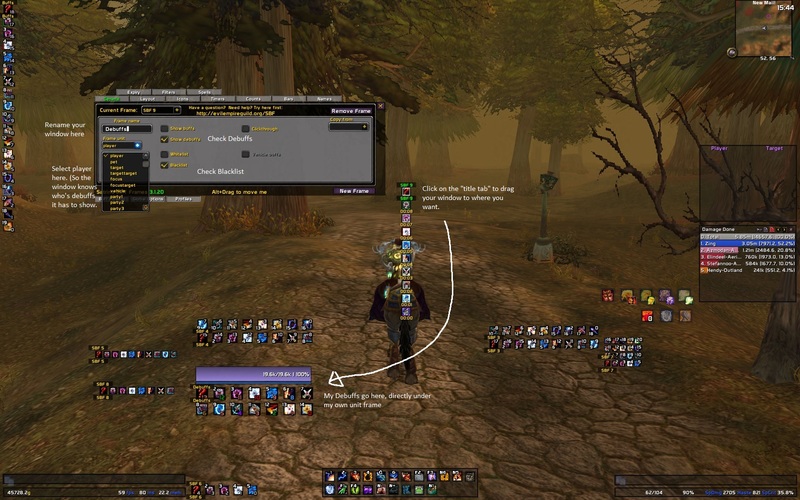 The following will describe how to set up a basic window that shows YOUR (the player) debuffs. Create a new frame as before by clicking the “New Frame” button in the bottom right hand corner. Again, you need to move your window to where you want your debuffs to be. This is a matter of preference. Many people show their debuffs close to where their buffs are. *Personally* I like to see my debuffs close to my own unit frame. This means I never fail to notice a debuff on me and further more, I have to scroll a very small distance to check what the debuff is!. In the tabs that appear at the top of the window, you will find one entitled “Layout”. Click on this. This will open a tab that allows you to choose how many buffs or debuffs a window can show, whether they are shown in columns or rows, how many per row, how large they are and so on. Select the check box to the right that says “Rows”. This will sort your debuffs in rows (horizontal alignment) as opposed to columns (vertical alignment). Frame Visibility – I have all my frames to set to show “Always”. You can alter them to show only when you are in combat, only when you are in a party or raid and so on. This can help you to create a very minimalistic UI should you choose. “Big” – you’ll see a check box entitled “big”. Clicking this, as you can imagine, makes your debuffs huge. This can be useful for people who struggle to notice things, but you can change the size of your debuffs anyway so I leave this option alone. 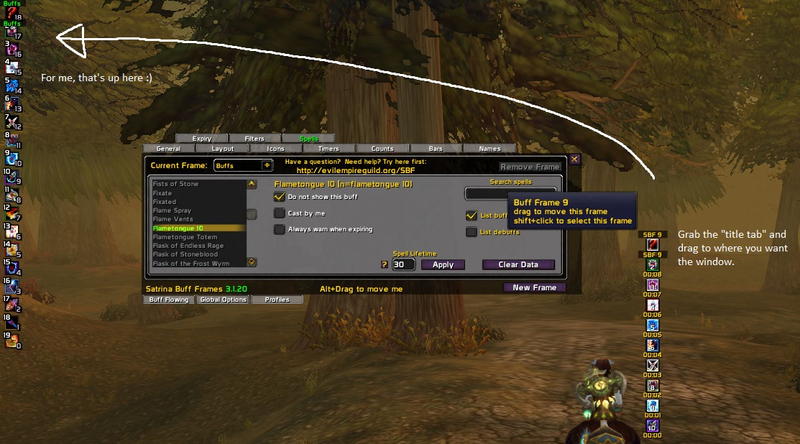 Buff Spacing – This tells the addon how far apart you want your debuffs to be. Do you like your debuffs to be all close together? Or do you like a space between them? Decreasing the x and y values will bring the debuffs closer together. Increasing will spread them apart. Type /sbf options to open your configuration window. At the top will be a drop down window allowing you to choose which buff / debuff window you wish to edit. In this example, I will change my buffs. 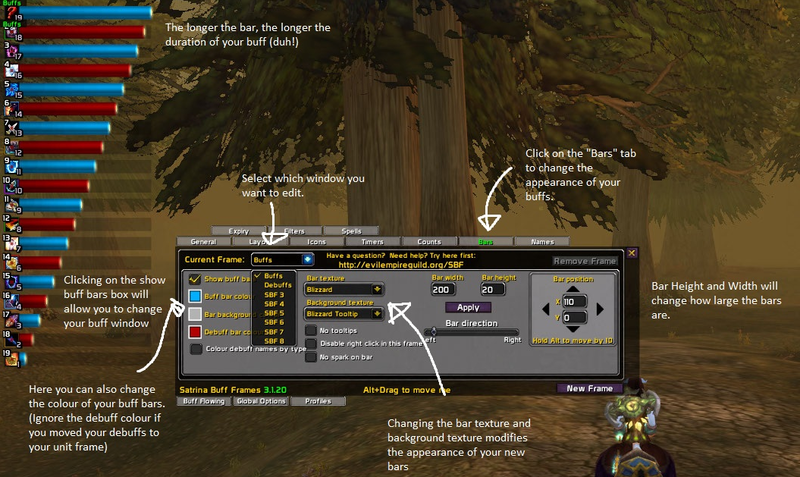 As you can see from the screenshot, there are a lot of options for changing the appearance of your buff bars. You can customize the size, colour and so on. Adding a timer will allow you to see how long is left on a buff without mousing over the icon. Select the tab entitled “Timers”. How Do I set Up a Buff or Debuff Bar for My Target Instead of Me? Again, type /sbf options to open your configuration window. Click on the new frame button to the bottom right and a new frame will appear. Scroll over to name this frame. In the drop down menu below the frame’s name, select “Target”. This is telling your addon that the new window is showing target buffs or debuffs and NOT yours. Click the appropriate check box to decide whether this window is for target buffs or debuffs. Drag your window to wherever you want. For me. I have them both close to my target window. In the same way, you can create windows for your pets, your focus targets and so on. Lightning Shield for Elemental in Next Beta Build and Cataclysm Collectors Edition Revealed.